Known for their lovely singing voices and bright coloration, canaries make an excellent pet for bird enthusiasts or anyone simply looking for a companion animal. Native to the Canary Islands, these charming birds come in distinct breeds, each with their own intriguing set of attributes. Understanding what these are and how they affect a canary's appearance and behavior is vital in knowing which kind of canary is right for you. As its name implies, the color-bred canary is a breed that is valued for the wide variety of the canary's colors. Yellow, pink and even silver or bronze are all striking hues to be found in a color-bred canary's feather coloration, according to ParrotParrot.com. Color-bred canaries as a breed contain many different varieties of individual birds. Reddish hues, for example, are found in Cinnamon Canaries and Red Lipochrome Color Canaries. The Gloster Canary, on the other hand, is a color-bred bird of light yellow hues. Once again, the name of this particular canary breed is telling--the song canary is bred for its melodic singing abilities. 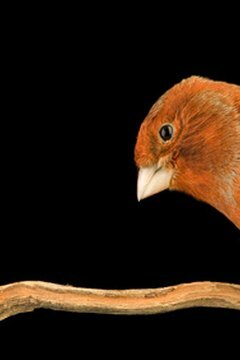 According to AvianWeb.com, the song canary breed includes birds that exhibit distinct and different song patterns. Roller Canaries are song canaries with a soft, sweet song. The American Singer, another canary in this breed, has a louder, more melodic song than the Roller. The Spanish Timbrado canary is a song canary whose singing is reminiscent of Spanish music. The song canary breed is an excellent place to look for a canary whose singing will be pleasing to you if you plan on keeping one as a pet. While other canaries are bred specifically for their coloration or song patterns, the type canary breed involves physical attributes such as size and stance. Type canaries are a breed prized for the array of physical features particular to each bird. The Fife, for instance, is a type canary that tends to be small and easy to breed. Another member of the type canary breed is the Yorkshire, which is the longest canary available and possesses a unique, erect, "gentlemanly" stance when perched. A popular type canary is the Crested canary, which has a tuft of feathers atop its head rather than the traditionally smoothed-down feathers typical of other breeds of canary. For unique physical attributes, type canaries are the breed to examine to find the bird that fits the shape, size and stance you're seeking.